Feelings demand to be felt. There’s no getting around that! But how we feel on the regular (like our baseline feeling, you know?) is actually more of a habit than an emotion demanding to be felt. Wouldn’t you agree? It’s a learned habit to come back to our comfortable baseline feeling. Have you ever noticed a shift in that baseline? It can happen slowly or over time. Chances are if you look back you can identify at least one period in your life where you felt exceptionally gloomy or just not fully present for a few weeks, or longer. There’s also the opposite: feeling like time has been flying by for weeks on end without giving you any chance to slow down and take a breath. Sometimes these states of being start in an instant, like when we get some bad news or are hit with a stressful situation… but other times, we learn these feelings slowly… incorporating just a little more of the feeling every day until suddenly we’ve built ourselves into feeling really down (or super overwhelmed) every day- and that’s when the feeling becomes sort of like a state of “rest,” that you’ve grown comfortable in. It’s okay! It’s not the end of the world. You have an opportunity once you realize you’ve made a habit of coming back to a feeling you don’t want to feel. This is your opportunity to choose again! The great things with habits is that they can be unlearned and relearned in ways that suit you better. 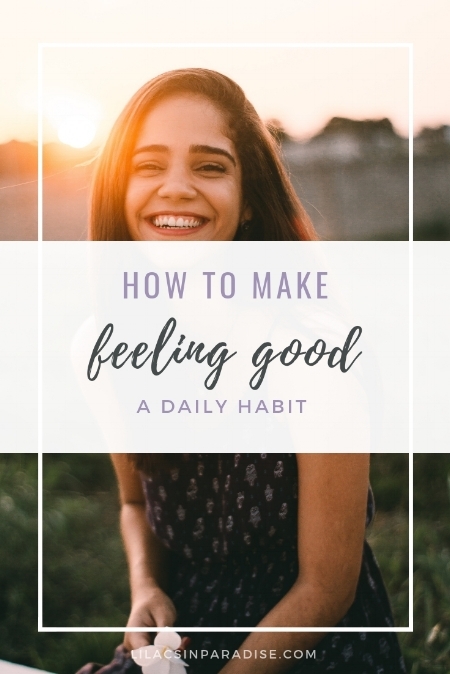 Here are the three steps I take in order to step into a fresh state of being and make it a habit to feel good! Step 1: Embrace where you are. If you’ve been resisting feeling something or if you’ve been picking at the way you are currently, I want you to let that feeling go. Forgive yourself for any shortcomings and give yourself permission to simply be exactly where you are. If you feel like you’re too much or too little of anything at all, I want you to just breathe in, thank yourself for being at all, and breathe out and thank yourself for being a human being capable of so much growth and change and potential. Where you are is just as important in your journey as where you’re actually going. This is a step along the way and if you never took it, you’d always be one step further from your goal, ya know? Step 2: Focus on what you DO want. Gone are the days where you try to feel happy by hating your sadness or resenting your anger or wishing away your bitterness, k girl? Nah. Instead of picking at the way you are today, I want you to fall in love with the way you are tomorrow. Look at your future self, the one who is radiating all that you want to radiate in this world, who feels the way you want to feel and lives the life you want to live. If you can imagine it, you absolutely can become it (someone wise probably said that), so imagine away, love. Journal through it or talk with somebody about the dream you have for your future self. Bring her to the front of your mind every single day- especially in the morning or evening if you have a routine! This step is KEY, so don’t skip it! Step 3: Show that gratitude! Gratitude is one of the highest vibes you can tap into! So soak it all in, give it off, let the thanks shine. Always. Remember that beautiful future we talked about in step 2? Allow yourself to be so grateful for it! Think about your past self and how amazed she would feel about who you are today- like your 7 year old self. And now realize that to your future self, you TODAY are that 7 year old self. So THANK that future self for existing. Imagine being able to thank her for working to grow so much as a person and create such a beautiful life. You’re putting this effort forth for that life, so allow yourself to feel the gratitude for it and embrace the person you are today- the one who made the decision to read this post and take notes and actually spark the changes that begin the rest of your dreams coming true! Commit to doing this for 14 days, then check in with yourself to see how it feels. Trust the process and you’ll see a powerful shift in your state of being and the way you feel from day to day, especially in those little moments that mean the most… and that you might be missing out on by staying stuck in a down feeling or a tangled mess of overwhelm. Take your life back into your own hands. P.S. I recently read The Big Leap and it is AMAZING for this!! Seriously check it out if you want to learn more around this topic.